Alexa Monroe is in San Francisco to celebrate her sister's promotion when she gets stuck in an elevator for an extended period of time with an attractive stranger. Naturally, they strike up a conversation and Alexa learns that the hot guy, Drew Nichols, is a paediatric surgeon, in town to go to the wedding of his ex-girlfriend and one of his best friends. Obviously, he's not exactly thrilled, and the woman supposed to be his plus one cancelled on him. While they eat some of Alexa's purse snacks (she has cheese and crackers in there to bring to her sister's room), Alexa is persuaded to be Drew's fake girlfriend for the weekend. While they barely know one another, it's clear that Alexa and Drew have chemistry in spades. After the wedding, they hook up, but rather than go their separate ways the morning after, they spend the day together and agree to keep seeing one another. Alexa works in Berkeley, as the Mayor's chief of staff, while Drew works at a hospital in Los Angeles. So they can only really see one another on weekends, when either one can afford to fly to see the other. Alexa really likes Drew, but he made it very clear at their very first meeting that he doesn't really do long term relationships (he tends to bail when things start getting really serious, but always stays friends with his exes). How long can she keep flying to LA for a guy who will eventually present her with the "Let's just be friends" talk? Representation is hugely important, and there just aren't enough romances written by or featuring women (or men, for that matter) of colour. 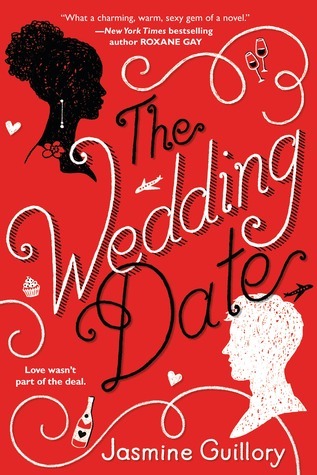 The Wedding Date has a female protagonist who is black (she's also described as curvy and larger than your average woman - which I found incredibly refreshing, plus size heroines are also few and far between), while the male love interest is white. While his best friend and fellow doctor at the hospital in LA is Latino (and a great supporting character, whose book I'm very excited to read), it's quite obvious that Drew doesn't really know a lot of people of colour and that he has never really had to think about what it's like to be one in a large group of mostly white strangers (this is the situation Alexa faces when going with him to the wedding). Being a handsome white man, Drew just isn't very aware of his privilege and it's nice that the differences in their experience are covered early on in the book. Being from different ethnicities is only one of the challenges facing Alexa and Drew. They are both professionals who care deeply for their jobs (and it's refreshing to have book characters who actually seem to do something for a living). It's difficult for them to find the time to see each other, since they live in different cities and plane tickets cost quite a bit of money. When communicating via text, nuances are lost and there's a couple of times when they have some fairly tense arguments based on a text message that could have been cleared up fairly easily if they were speaking face to face. The biggest problem facing them, however, is Drew's rather baffling unwillingness to commit. As seems to be the norm for me this year, I'm reviewing this book almost a month after I finished it, and as such, some of the finer details are fuzzy to me. I forget whether we actually get a good explanation as to why he consistently bails on a relationship the minute it starts getting serious. Apart from his insistence that he can't be someone's life partner and only wants something casual, he's clearly a smart, handsome, successful guy. He's devoted his life to curing children, for heaven's sake. But the whole "can't commit" thing makes him seem rather immature. Another thing I disliked about him is how insecure he was about Alexa's relationship with her colleague (and one of her best friends) Theo. No matter how many times Alexa assured him that she had no romantic (or sexual) feelings towards her friend, he seemed needlessly suspicious of their friendship. Men and women can be friends without wanting to jump in the sack with one another. If Drew can't accept and not be threatened by Alexa's friendships, I don't see a long term future for them - it wouldn't be healthy. Alexa was pretty much great, and I liked her friendships with both Theo and Maddie, as well as how passionate she was about her job, not to mention the reasons she wanted her special project for at risk youths launched. I could very much identify with her insecurities about her body and figure, but like that mostly, she was happy to be who she was, and didn't constantly limit what she allowed herself to eat or drink what she wanted, not afraid to enjoy life. You really got a feel for her life outside of her romantic relationship, which made her seem like more of a complete human, not just a stock character. I also loved Carlos, Drew's colleague, who sees that he's found a great thing in Alexa from pretty much their first meeting and keeps trying to convince his friend that he's a complete idiot if he doesn't take good care of her, thanking his lucky stars he was fortunate enough to find such a great girlfriend. As I frankly liked him more than Drew in the scenes they shared, I was very glad to discover that he's the hero in Guillory's follow-up to this (which is already out, because I waited most of a year to finally picking this up). I read a lot of rave reviews about this when it came out in January. Sadly, I think neither 2017 nor 2018 have been particularly good years for memorable romance, destined to become much beloved classics. This book is fine, and I enjoyed it, but in previous years, when great romance seemed to be everywhere, it would not even have made it into my top ten. Nevertheless, I'm always glad to discover a new author. Of the hyped about novels by women of colour, I liked this about a million times more than the sadly very disappointing A Duke by Default. I will read more of Guillory's contemporary romances. I can't say the same for Alyssa Cole. Judging a book by its cover: When I first saw the cover for this book, I was convinced it must be a historical romance. The curly font and the silhouettes just seem to indicate a historical to me, and I'm surprised this is how Guillory's publisher chose to sell her first, contemporary, romance. Yes, there are tiny details that tell you it is in fact not set in the Regency era (the little air planes probably being the most obvious hint), but you only see those if you look more closely. It's a pretty cover, but I still think it's a strange choice by the publisher.